UFO ON A CLOUD MINI DIORAMA by Tomy! In 2002 Tomy company of Japan produced several different sets of Mini Aliens and Space Ships. These unique Mini UFO Dioramas stand approx. 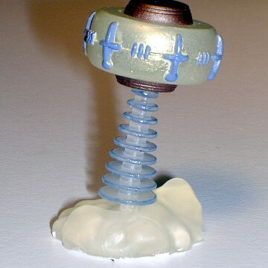 2 inches tall and are made of flexible vinyl. The detail and coloration is just amazing given the size of these figures. 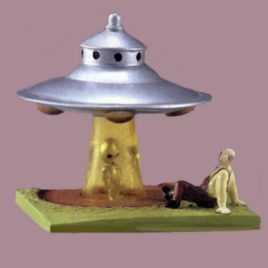 Some of the UFOs are made of translucent vinyl and all are unique UFO Dioramas. Great for the top of computers!! These UFO Dioramas come in bags and the parts must be "Snapped" together. These CHOC O VADERS UFO Dioramas are out of production and almost impossible to find even in Japan. CLAWMARK TOYS WARNING; NOT SUITABLE FOR VERY YOUNG CHILDREN DUE TO SMALL PARTS! 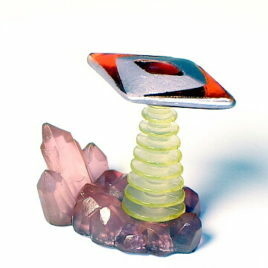 UFO ON STRANGE CRYSTAL PLANET MINI DIORAMA by Tomy! 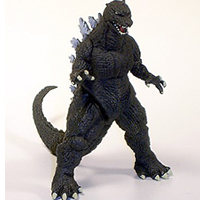 In 2002 Tomy company of Japan produced several different sets of Mini Aliens and Space Ships. 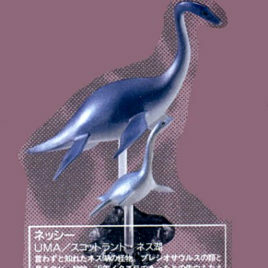 These unique Mini UFO Dioramas stand approx. 2 inches tall and are made of flexible vinyl. The detail and coloration is just amazing given the size of these figures. Some of the UFOs are made of translucent vinyl and all are unique UFO Dioramas. Great for the top of computers!! These UFO Dioramas come in bags and the parts must be "Snapped" together. 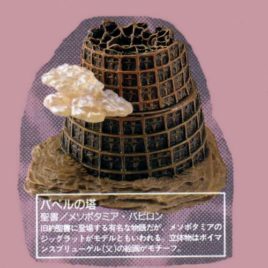 These CHOC O VADERS UFO Dioramas are out of production and almost impossible to find even in Japan. CLAWMARK TOYS WARNING; NOT SUITABLE FOR VERY YOUNG CHILDREN DUE TO SMALL PARTS! 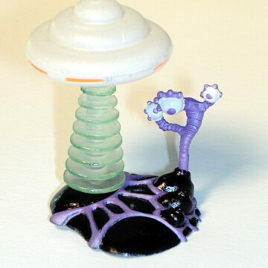 UFO ON WIERD PURPLE PLANET MINI DIORAMA by Tomy! 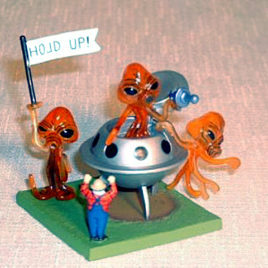 In 2002 Tomy company of Japan produced several different sets of Mini Aliens and Space Ships. 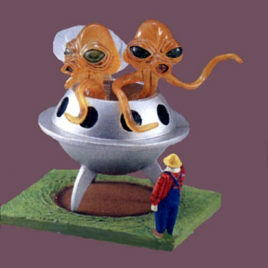 These unique Mini UFO Dioramas stand approx. 2 inches tall and are made of flexible vinyl. The detail and coloration is just amazing given the size of these figures. 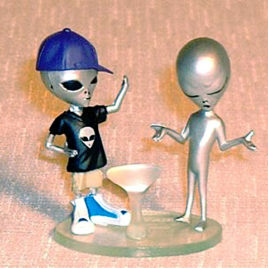 Some of the UFOs are made of translucent vinyl and all are unique UFO Dioramas. Great for the top of computers!! These UFO Dioramas come in bags and the parts must be "Snapped" together. 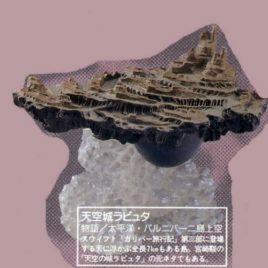 These CHOC O VADERS UFO Dioramas are out of production and almost impossible to find even in Japan. CLAWMARK TOYS WARNING; NOT SUITABLE FOR VERY YOUNG CHILDREN DUE TO SMALL PARTS! UFO OVER PYRAMIDS MINI DIORAMA by Tomy! 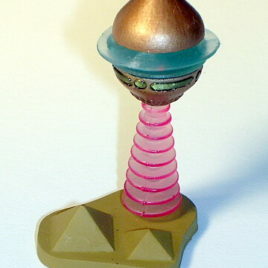 In 2002 Tomy company of Japan produced several different sets of Mini Aliens and Space Ships. These unique Mini UFO Dioramas stand approx. 2 inches tall and are made of flexible vinyl. The detail and coloration is just amazing given the size of these figures. Some of the UFOs are made of translucent vinyl and all are unique UFO Dioramas. Great for the top of computers!! These UFO Dioramas come in bags and the parts must be "Snapped" together. These CHOC O VADERS UFO Dioramas are out of production and almost impossible to find even in Japan. CLAWMARK TOYS WARNING; NOT SUITABLE FOR VERY YOUNG CHILDREN DUE TO SMALL PARTS! 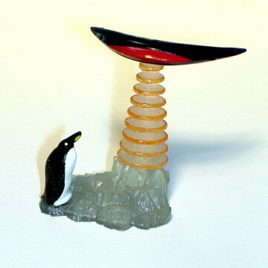 BOOMARANG UFO WITH PENGUIN MINI DIORAMA by Tomy! In 2002 Tomy company of Japan produced several different sets of Mini Aliens and Space Ships. These unique Mini UFO Dioramas stand approx. 2 inches tall and are made of flexible vinyl. The detail and coloration is just amazing given the size of these figures. 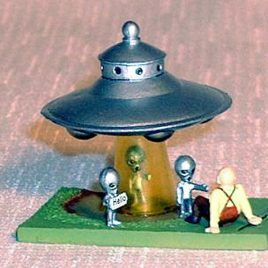 Some of the UFOs are made of translucent vinyl and all are unique UFO Dioramas. Great for the top of computers!! These UFO Dioramas come in bags and the parts must be "Snapped" together. These CHOC O VADERS UFO Dioramas are out of production and almost impossible to find even in Japan. CLAWMARK TOYS WARNING; NOT SUITABLE FOR VERY YOUNG CHILDREN DUE TO SMALL PARTS! Each Collect Club figure is polyvinyl resin and beautifully detailed. They have been out of production since 2002. 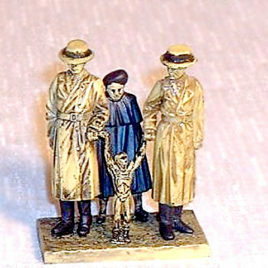 They are approximately 2-4 inches high depending on the individual figure. They require assembly. 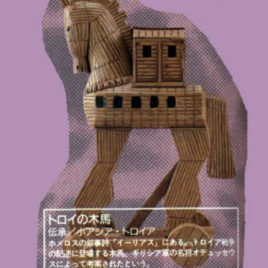 Each comes with a card, which has artwork of the figure and an explanation (in Japanese) of the phenomenon. 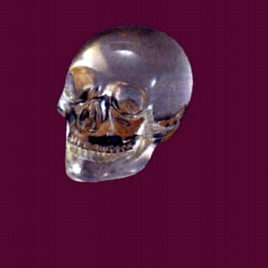 The Crystal Skull has a removable jaw bone. Each Collect Club figure is polyvinyl resin and beautifully detailed. 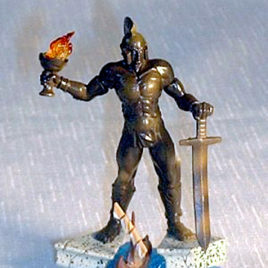 They are out of production since 2002 and hard to find.They are approximately 3-4 inches high. They require assembly. 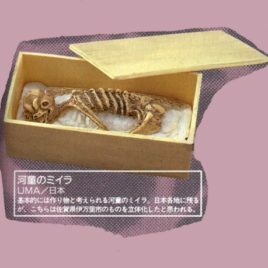 Each comes with a card, which has artwork of the figure and an explanation (in Japanese) of the phenomenon. Castle in the Sky from the movie by Miyazaki and Studio Ghibli. Each Collect Club figure is polyvinyl resin and beautifully detailed. This series is out of production and hard to find. They are approximately 3-4 inches high. They require assembly. Each comes with a card, which has artwork of the figure and an explanation (in Japanese) of the phenomenon. 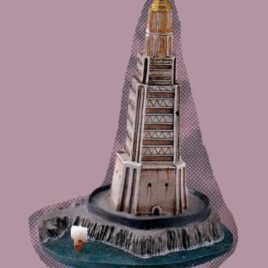 Lighthouse of Alexandria, one of the seven wonders of the world. 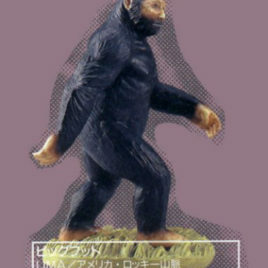 This is from the RARE First Collect Club series produced in 2002 Each Collect Club figure is polyvinyl resin and beautifully detailed. They are approximately 2-4 inches high. They require assembly. Each comes with a card, which has artwork of the figure and an explanation (in Japanese) of the phenomenon. Loch Ness Monster and Baby aka pleisosaurus. 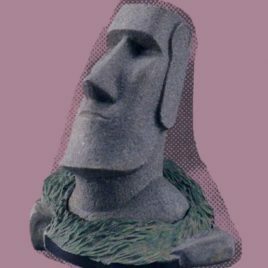 Each Collect Club figure is polyvinyl resin and beautifully detailed. They are approximately 3-4 inches high. They require assembly. Each comes with a card, which has artwork of the figure and an explanation (in Japanese) of the phenomenon. 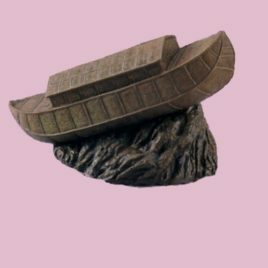 Noah’s Ark. Each Collect Club figure is polyvinyl resin and beautifully detailed. They have been out of production since 2002. They are approximately 3-4 inches high. They require assembly. 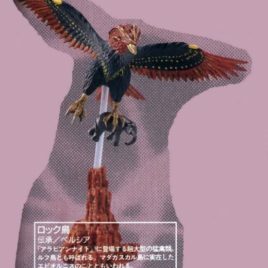 Each comes with a card, which has artwork of the figure and an explanation (in Japanese) of the phenomenon. 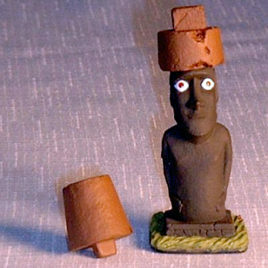 Easter Island Moai with two interchangeable head pieces. 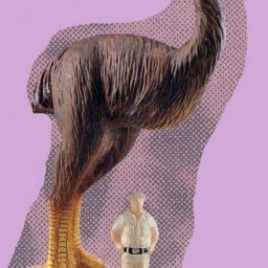 Each cryptozoology Collect Club figure is polyvinyl resin and beautifully detailed. They are long out of production and hard to find. They are approximately 3-4 inches high. They require assembly. Each comes with a card, which has artwork of the figure and an explanation (in Japanese) of the phenomenon. 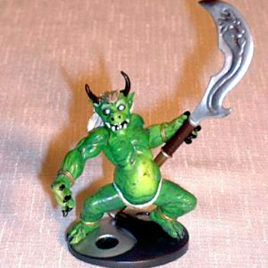 Oni Japanese Demon (green) The oni is a cultural icon prevalent all over Japan and is associated with thunder and wind gods. These giant ogres are sometimes viewed as causing evil but at other times seen as protection from evil. The festival of Setsubun which occurs one day before Spring has a custom of throwing beans while saying “Oni wa soto: Fuku wa uchi” Get out Demon! Come in Happiness! 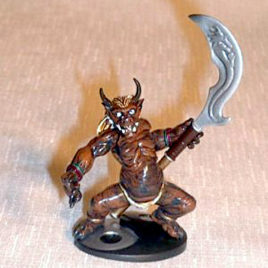 The oni is a popular design for tattoos.